A hedge in Bible lands was and is used as a wall of separation. 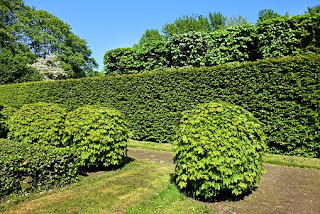 The hedge separates orchards and gardens, and is used as a wall of protection. From our text it is obvious that God was looking for a man to fill the gap, stand up for righteousness; but not a single man could be found. I believe the principle is clear. Not only are the Marines looking for a few good men, so is God—men of righteousness who will separate themselves from the world and stand up for righteousness. The opportunity for us to mentor those young men is great. We should very well take advantage of this opportunity. After emerging victorious in Barcelona, Melvin Stewart threw his victory flowers to Mr. B and, “I told him, ‘I love you.’ I am going to give him my gold medal, too. Mr. B is seventy-six years old and I do not do many things without talking to him first. He’s incredible! And he’s been married to the same woman for fifty-three years. It is too bad, but older people are a great resource that too many young people do not rely on today.” Melvin Stewart appears to be a gold medalist outside of the pool as well. Are you allowing God to use you to stand in the gap and impact others for God’s glory? ✞ The next time you see or hear of a hedge, remember God is looking for you to stand in the gap for His glory.